Earlier today I carried out some contemporary archaeology. The site of excavation was Nottingham’s branch of Modelzone. This toy and hobby retailer has gone into administration and all eighteen of its remaining stores will close over the coming weeks. (1) Today it was the turn of the outlet at Broadmarsh shopping centre. Its demise is part of the terminal decline of this much-derided mall. Back in January I watched the last death throes of shoe emporium Gordon Scott. (2) This had occupied a unit adjacent to Modelzone ever since Broadmarsh opened in the 1970s. Nowadays customers in search of footwear must exit the mall and make their way to Lister Gate. Given that they are now things-of-the-past, all manner of quotidian Modelzone-related artefacts have suddenly accrued heritage-value. Thus the till receipt recording my last purchase plus the plastic carrier bag with its Modelzone logo merit preservation in preparation for their future museum-status. But not all Britons are as enthusiastic for another Middle East campaign as the current British government. (4) Upon leaving Broadmarsh I headed for Old Market Square. At “Speakers’ Corner” I came across a small band of protestors, urging the people of Nottingham to join them in opposing any British involvement in Syria’s bloody civil conflict. We shall have to acquire them from an online store, of course given that soon the notion of physical shops on something that used to be known as “the high-street” will be a quaint, nostalgic Woolworths-sweet-wrapped memory (the last bag of which sold on eBay for a reported £14,500 (5)). (1) Simon Neville, “Modelzone toy retailer collapses after failure to find buyer”, The Guardian, 28/09/2013, http://www.theguardian.com/business/2013/aug/28/modelzone-collapses-deloitte-fails-buyer. (2) Stuart Burch, “Respect for the Riddler”, 27/01/2013, http://www.stuartburch.com/1/post/2013/01/respect-for-the-riddler.html. (4) “Syria crisis: David Cameron makes case for military action”, 29/08/2013, http://www.bbc.co.uk/news/uk-politics-23883427. (5) “Last ever bag of Woolworths pick 'n' mix sweets sells for £14,500 on eBay”, Daily Mail, 21/02/2009, http://www.dailymail.co.uk/news/article-1151542/Last-bag-Woolworths-pick-n-mix-sweets-sells-14-500-eBay.html. Cancel that box of toy soldiers! In a rare outbreak of democracy, the Westminster parliament has put a temporary halt to a British foreign policy formulated in Washington DC. (1) Can it really be that, at long last, “Britain's illusion of empire is over”? (2) Only time will tell. But for now at least let us savour the true taste of Tony Blair’s political legacy. (1) “Syria crisis: Commentators react to Cameron defeat”, BBC News, 30/08/2013, http://www.bbc.co.uk/news/uk-23894749. (2) Polly Toynbee, “No 10 curses, but Britain’s illusion of empire is over”, The Guardian, 29/08/2013, http://www.theguardian.com/commentisfree/2013/aug/29/no-10-curses-but-empire-is-over. Museum: training ground for democracy? This blog is being written during day two of the East Midlands Heritage Conference 2013. (1) One of the speakers is Graham Black, a colleague of mine at Nottingham Trent University. He has just spoken passionately about the need for museums to work in partnership with their communities. Over the course of the next two years his Arts Council-funded “Innovation in Museum Displays” will facilitate this across the East Midlands. At the heart of the “Innovation in Museum Displays” initiative is the notion that museums should consider giving up control over their collections, exhibitions and their decision-making processes. They should instead incorporate the voices and ideas of their users/visitors into everything they do. All this talk of public participation and democratic museums is interesting, not least because of the widespread disconnect between the electorate and traditional political parties. The extent of this repositioning of museums remains unclear, however. Does this supposed change come at the expense of the museum’s traditional role of collecting, preserving and displaying objects? And are museums really prepared to give up control? Should this be sanctioned and what might be the consequences? And is this a genuine, deep-seated shift in our understanding of museums? Or is it simply a ruse to ensure continued support at a time of increasing political pressure and decreasing financial support? (1) ‘Stronger together’, The East Midlands Heritage Conference 2013, Wednesday 5 & Thursday 6 June, at Nottingham Conference Centre, Nottingham Trent University, http://emms.org.uk/events/detai/east_midlands_heritage_conference_2013. (2) See Stuart Burch, “Taking Part: Performance, Participation and National Art Museums” in Knell, S. et al (incl. Burch, S.) (ed.) National Museums: New Studies from Around the World, London: Routledge, 201, pp. 225-246, available at http://www.stuartburch.com/uploads/8/1/9/1/8191744/2011_burch_taking_part.pdf. (3) Mill, Essays on Politics and Culture cited in Cities @ Crossroads: Digital Technology and Local Democracy in America, Boston University School of Law Working Paper No. 11-11, Boston University School of Law, Harvard Law School, 2011, p. 10, available at http://www.bu.edu/law/faculty/scholarship/workingpapers/2011.html. This is indicative of a paradox that runs right through Thatcher’s long and eventful period in power. It is characteristic of Mr Cameron that he should deliver such a contradictory statement. If Thatcher “divided opinion” how can “the British people” be of one mind? And if she loved Britain so much, how could Thatcher encourage a climate in which some Britons prospered and thrived at the expense of others? Once the funeral is over thoughts will turn to a more permanent commemoration. At that point the Iron Lady will be transmogrified into bronze. The obvious place to site such a memorial is Parliament Square. (5) There she can surmount a pedestal alongside the petrified Churchill and generate an interesting dialogue with the statues of two South Africans, Jan Smuts and Nelson Mandela. Thatcher’s opposition to international sanctions against Apartheid South Africa – plus her hostility to German reunification – are reminders that differences of opinion over her legacy are not confined to England, Scotland, Wales or Northern Ireland. In each of these areas one can cite a litany of issues that remain contentious today, from the North-South divide in England to the piloting of the Poll Tax in Scotland, the decimation of the industrial communities of South Wales and her administration’s secret negotiations with the IRA in stark contrast to Thatcher’s publicly stated position. Waves of attacks will be unleashed on any tangible memorial to Thatcher. These will be dismissed as vandalism or accepted as iconoclasm depending on one’s point of view. But the daubs of paint or attempts at decapitation will confirm one thing. Mrs Thatcher achieved much, but by her own measure she failed in at least one regard. She came to office urging Britons to “get together” and help her “bring harmony”. Yet her enduring legacy is division and discord. And that’s something that even David Cameron cannot deny. (3) The perpetrator was Paul Kelleher, a thirty-seven year old theatre producer. His justified his actions by claiming that the attack was in protest against global capitalism. See Stuart Burch, On Stage at the Theatre of State: The Monuments and Memorials in Parliament Square, London (A thesis submitted in partial fulfilment of the requirements of Nottingham Trent University for the degree of Doctor of Philosophy, March 2003), pp. 350-351. (4) Kirk Savage, “The politics of memory: Black emancipation and the Civil War monument”, in John R Gillis (ed. ), Commemorations: the politics of national identity, Princeton University Press, 1994, p. 135. (5) This was something that I called for a decade ago: “An image of Margaret Thatcher in the sacred yet so vulnerable domain of Parliament Square would infuse it with ‘living power’. For the statue, taking its rightful place alongside Churchill, would be finely posited between veneration and disdain and then, in the fullness of time, between neglect and ignorance.” Burch, On Stage at the Theatre of State, 2003, p. 351. I have been disrupted twice in the last couple of days. On both occasions the disruption has been presented to me as positively welcome – something to celebrate. The first disturbance arose during a talk about MOOCs. This acronym stands for massive online open courses. Their proponents claim these to be the-next-big-thing in education. Old fashioned universities beware: soon they’ll be superseded by entirely online providers charging a fraction of the price and servicing hundreds of thousands of participants drawn from the four corners of the globe. This is all thanks to disruptive technologies: IT innovations that disturb the status quo as surely as music downloads have annihilated the high-street record store. Be that as it may, listening to a gorgeously slick gentleman from a posh US university preaching about disruption made me suspicious. Don’t be lulled into thinking that this particular brand of commotion is inherently exciting, radical or open. Because that would be to belie the imperialistic ambitions of many of the organisations that lurk beneath the mantle of disruptive technology. The next day also proved to be cheerfully disruptive. On this occasion the challenge to the natural order occurred towards the close of a highly civilized seminar hosted by the Arts and Humanities Research Council. Representatives of groups funded by the AHRC’s various knowledge exchange schemes were invited to meet in Bristol and share ideas. One participant happened to mention how her scheme had helped facilitate “disruptive thinking”. This in turn got me thinking disruptively. To what extent do funders tolerate such behaviour? Moreover, “disruptive thinking” is promoted because it can lead to failure. But it would take a bold person to declare in an end-of-project-report that their research was brilliantly abortive, that they didn’t bother doing what they had promised and had in fact consciously subverted the aims of the funding organisation: all in the name of disruptive thinking. Would such disruptions be welcome? Would they lead to renewed investment from a grateful funding body? Bear in mind that these sources of money must also be accountable to a board of trustees, some government department or the largess of a tax avoiding business. I pondered these things whilst making my way to Bristol Temple Meads to catch my train back to snowy Nottingham. Suddenly I looked up and – to my surprise – found myself in the midst of a ferocious riot. Sword-wielding soldiers on horseback were pitching into a crowd of angry protestors. Such was the ferocity of this incident that I was mighty pleased to have turned up after it had started. Precisely 182 years after. The incident in question was taking place in a large mural painted on the backdrop to a patch of rough ground adjacent to the Bath Road. It commemorates the Reform Bill riots that took place in Bristol’s Queen Square in 1831. This disturbance has a resonance in the city to which I was headed. In Nottingham similar acts of insurrection also took place in 1831. On 10th October a crowd of residents, frustrated by the lack of progress towards electoral reform, gathered in Market Square before heading up the hill to the site of the old Nottingham castle, then the home of the dukes of Newcastle. They burnt the mansion to the ground. It stayed that way for fifty years until the gutted shell was transformed into a municipal museum and art gallery. The fullness of time has turned the disruptive events of 1831 into local histories. They are also part of a neat linear story of political change leading to universal suffrage. But would the imperfect democracy enjoyed by Britons today have been achieved if some individuals weren’t prepared to disrupt the present order? And wouldn’t it be ironic if these disruptive deeds were to one day become the subject matter of some not-for-profit (sic) MOOC or even a British knowledge exchange initiative? Goodness, what a disruptive thought! The third one this week! The front page of today’s BBC news website reveals a great deal about how historical events impinge on the present. This needs to be seen as indicative of a widespread obsession with the past. But it shouldn’t make us overlook the fact that the primary interest is current affairs. Simply put, history needs to have some contemporary resonance in order to count as “news”. This is the case with the deaths of two men in their 90s. Their passing is, of course, a personal loss to their friends and relatives. I never knew them, but I am invited to pay my respects because these two gentlemen feature in the collective consciousness. This is due to two events that form part of the national story, namely the Jarrow March of 1936 and the experiences of Britons incarcerated overseas during the Second World War. The demise of Con Shiels (the last survivor of the Jarrow March) and Alfie Fripp (a veteran of no fewer than twelve POW camps) marks the moment when two iconic occurrences pass from lived experience to “history”. This liminal moment gives the past a special frisson. We watch as the final living link to a momentous event is broken. This is history in the making. There are lots of other issues that flow from these particular stories. Is history made by the many or the heroic (or villainous) few? Can we learn from “everyday heroes” like Con Shiels and Alfie Fripp? If so, what part (if any) do we play in history? And what actually counts as a historical event? How influential was the Jarrow March? Did it change the course of history? Or is its significance given undue importance by subsequent commentators? In the BBC’s report of the death of Con Shiels it is notable that the trade unionist, Steve Turner is quoted calling for a “new ‘rage against poverty’”. Similarly, in 2011 the Jarrow March was re-enacted to mark its 75th anniversary and draw attention to youth unemployment. This demonstrates how a historical “fact” is nothing without interpretation. And this makes it inevitable that the politics of the present will get woven into the patterns of the past. The Jarrow example provides a flavour of things to come. Get ready for the bickering and arguing that will be triggered when Margaret Thatcher dies! The shadow of the Iron Lady looms large over another historically-flavoured news story: the status of the Falkland Islands (Islas Malvinas). This latest episode relates to Cristina Fernandez de Kirchner’s open letter to British prime minister, David Cameron in which she decries the continuance of “a blatant exercise of 19th-century colonialism” and calls for a negotiated solution as urged by the General Assembly of the United Nations way back in 1965. Interestingly enough, one of the BBC web links connected to de Kirchner’s rhetorical salvo refers to new documents released under the British government’s 30-year rule. These reveal just how surprised Thatcher was by the Argentine invasion. Access or restrictions concerning such primary evidence play a crucial role in determining how history gets written and re-written. Another link stemming from the latest crisis facing the Falkland Islands reminds us of the glorious / tragic events of 1982 via the commemorative events marking the thirtieth anniversary of the end of the Anglo-Argentine war. An anniversary such as this represents an additional way in which the past enters the present. The commemorative re-enactment of the Jarrow March is a case in point. A further example is to be seen amongst today’s crop of news stories, namely the centenary of Rhiwbina garden village in Cardiff. But what about events of today that are destined to become tomorrow’s history? Well, the year that has just passed has gone down in the record books as the “second wettest on record”. There is reason to believe that this will soon be surpassed, with reports that “extreme rainfall” is on the rise. Alongside the text are photographs indicating that the Kachin Independence Army (KIA) has come under attack from Burmese soldiers armed with Saab AB’s Carl Gustav 84mm Recoilless Rifle (“The best multi-purpose weapon there is”). We know this because at least one such armament plus ammunition were left behind when the state’s forces were driven into a retreat by their KIA opponents. A serial number – 17248 – is clearly visible on the weapon pictured in Svenska Dagbladet. This should make it simple for Saab AB to confirm whether it was exported directly to Burma (in contravention of the 1996 EU export embargo) or, as is far more likely, that the arms found their way to Myanmar via one of Saab AB’s official customers (probably India or Thailand). This mishap should come as no surprise given the sheer quantity of Swedish-made arms that are being exported all over the world. However, what makes this particular incident noteworthy is the manner in which Svenska Dagbladet reported the news. At the very same time that it broke the story, the newspaper’s editors allowed a 32-page advertising feature to be inserted into that day’s paper. Entitled, Rikets säkerhet (The Nation’s Security), it is produced by MDG Magazines and edited by Christer Fälldin. In his introductory message Fälldin informs Svenska Dagbladet’s readers that this addition to their daily paper tackles what he considers to be one of the most significant political challenges facing Sweden, namely defence. Fälldin has therefore sought to use the inaugural issue of Rikets säkerhet to address “many of the security and defence issues” that are current today. Alas, one such issue that is missing from this “newspaper” (sic) is any discussion of the legal or moral dimensions of the arms industry and the responsibilities that Sweden has as a world-leading exporter of military equipment. The fact that the first issue of Rikets säkerhet was allowed to subsume Svenska Dagbladet’s report into the inherent risks involved in exporting arms is highly revealing. It exposes the extensive lobbying campaigns undertaken by powerful groups and individuals with vested interests in normalising and enhancing Sweden’s weapons industry. Rikets säkerhet represents a sophisticated attempt to scare the Swedish people by confronting them with amorphous threats and worries about the future. These dire warnings appear alongside advertisements from all manner of military-related organisations. They are in turn interspersed with associated “news” stories. This pseudo journalism is a thinly veiled attempt to convince Sweden’s political elite to continue to invest ever increasing sums in defence procurement and development. All this is a far cry from the Nobel-prize and IKEA-meatball image of Sweden so adored by the international media. Beneath an oh-so-sweet Nordic façade there festers a far from savoury side to Sweden. Just ask the people of northern Burma. (1) Bertil Lintner, “Svenska vapen hos Burmas armé”, Svenska Dagbladet, 11 December 2012, pp. 20-21. On Sunday 11 November a fascinating debate took place at Arkitekturmuseet (Sweden’s national museum of architecture). It marked the culmination of a weekend of activities to celebrate the institution’s fiftieth anniversary. Events included guided tours of the Rafael Moneo-designed building which Arkitekturmuseet shares with another of Sweden’s state museums, namely Moderna Museet. The highlight of the festivities focused on the commemorative publication, The Swedish Museum of Architecture: A Fifty Year Perspective. This was launched following a series of reflections by two contributors to the book, Thordis Arrhenius and Bengt O.H. Johansson (the latter was director of the museum from 1966-77). Rörby expressed reservations about such a shift in focus, fearing that an increase in breadth would come at the expense of depth and critical engagement. He was also troubled by the vague, empty rhetoric of the memorandum. On the other hand, the notion of going beyond what was expected of a “traditional” museum was nothing new. Rörby illustrated this point by citing Arkitekturmuseet’s past involvement in the often heated debate regarding Sergels torg in central Stockholm. He stressed the rapidity of the museum’s response which enabled it to react to a pressing, contemporary issue. This active engagement, however, was only possible because of the museum’s unrivalled collections of artefacts, architectural models and other archival documents. Rörby was of the opinion that the museum would find it far harder – if not impossible – to arrange such an exhibition in the additional field of design. This is because the museum responsible for the national design collection is another entirely separate institution, namely Nationalmuseum. The design holdings will remain there, despite Arkitekturmuseet’s increased mandate. In the wake of these failed initiatives comes the current half-baked decision to place the design burden on the ill-equipped museum of architecture. Meanwhile, in February 2013, Nationalmuseum will close for a period of four years during which time a multi-million kronor refurbishment will take place. This, one would have thought, would be the ideal opportunity to resolve the status of design in Sweden. The risk is that the investment in Nationalmuseum is being made against a contested, confused and contradictory context. On being asked about the relationship with her neighbour, Arkitekturmuseet’s director Lena Rahoult made a few platitudinous comments and paid compliments to Daniel Birnbaum, her counterpart at Moderna Museet. However, when it comes to Moderna Museet’s upcoming exhibition on Le Corbusier, it emerged that the museum of architecture will not be involved. (7) This, it strikes me, represents a potentially serious threat to the autonomy of Arkitekturmuseet. If the Le Corbusier exhibition is a success despite (or perhaps because of) the exclusion of Arkitekturmuseet, then the argument is being made that Moderna Museet is more than capable of taking over this field. Daniel Birnbaum would no doubt be delighted. He is a very shrewd operator. Upon taking over the running of Moderna Museet he erased all trace of its former director in the most charming manner: by turning the whole museum over to photography. This had a number of consequences. It facilitated a tabula rasa whilst showing Birnbaum to be both innovative and in step with the history of the museum. This in turn stifled any potential suggestion that photography was not being accorded sufficient attention. This was a smart move given that the formerly separate museum of photography had been subsumed into the collections of Moderna Museet on the completion of Rafael Moneo’s building in 1998. With this potential criticism snuffed out, Birnbaum then set about curtailing the independence of the museum’s satellite institution, Moderna Museet Malmö. This was led by Magnus Jensner until a “restructuring” made his position untenable and prompted his resignation. (8) In March of this year Jensner was succeeded by Birnbaum’s man in Stockholm, John Peter Nilsson. Against the background of these strategic manoeuvres the decision to mount an exhibition on Le Corbusier at Moderna Museet is no mere innocent happenstance. It can be interpreted as part of a calculated empire building process. And, if the recent debate at Arkitekturmuseet is anything to go by, Birnbaum is a giant among pygmies on the Swedish cultural scene. Perhaps mindful of this, at the same time as spouting her platitudes, Lena Rahoult has been busy mounting the barricades. She has taken the decision to withdraw Arkitekturmuseet from the bookstore that it has shared with Moderna Museet since the inception of Moneo’s building. All the books are being sold at a reduction of 60% whilst magazines and postcards are being flogged off for a few kronor. Once this stock has been disposed, Arkitekturmuseet will open a separate retail establishment in its own part of the locale. This development is notable given that the bookstore was one of the very few aspects of the building where the two institutions merged. Another is the shared ticket desk. Moneo designed the building to incorporate the old drill-hall where Moderna Museet began life and which is now occupied by Arkitekturmuseet. In so doing he provided a new entrance and closed the original doorway. Rahoult plans to reopen this entrance whilst keeping the other in use. Birnbaum is on record as describing this proposal as “ludicrous” (befängd). (9) Well he might, because one of the main criticisms of Moneo’s building is its very modest and hard-to-find entrance. Should Arkitekturmuseet prove to be the main gateway into the combined museum it may well increase the number of visitors to the architecture collection, but it will draw attention from what is currently the dominant partner, Moderna Museet. The proposed changes to the shop and entrance have led to claims that Arkitekturmuseet wishes to “break free from Moderna Museet”. (10) The paradoxical situation has therefore arisen whereby, at the same time that Arkitekturmuseet struggles to work across disciplines in one direction, it is placing barriers to the museum next door. Another example closer to home is Norway. However, in this case the forced union of art, architecture and design has been far from amicable or straightforward. But at least Norway’s National Museum of Art, Architecture and Design is being given a grand new building in which to unite. This is not the case in Sweden. No one should be surprised about this given the paltry cultural policies of the present alliance government under the stewardship of its mediocre minister of culture, Lena Adelsohn Liljeroth. When it came to the festivities to mark Arkitekturmuseet’s jubilee debate, the icing on the birthday cake occurred when the panel turned to the audience for questions and response. Up stepped Jöran Lindvall. He remains – as he was at pains to make clear – the longest serving director of Arkitekturmuseet (during the years 1985-1999). Nevertheless, he added pointedly, no one had thought to ask him to contribute to the fiftieth anniversary publication. His absence from its pages was a timely reminder that such official records are as partial as they are political. That much is shown by a similar publication released to mark Moderna Museet’s own fiftieth anniversary in 2008. Such historical tomes might seem to be rooted in the past, but their main aim is to seek to placate the politicised present whilst simultaneously shaping the uncertain future. As if to underline this, Jöran Lindvall presented the current holder of the post he once occupied with a bag stuffed full of newspaper cuttings and other documents from his private collection relating to exhibitions that took place during his time at the museum. He declared his willingness to donate these to Arkitekturmuseet, but on one condition: that it remain a museum devoted to architecture. Lena Rahoult accepted this generous offer. She could hardly do otherwise. It will be interesting to follow the fate of Lindvall’s loaded gift. Indeed, all those involved in museums would do well to keep track of events in Sweden and watch with interest as commentators, practitioners, museum professionals and politicians plot their next moves in a battle that is more comedy than tragedy. But that is not to say that the outcome is likely to leave very many people laughing. (1) The panel participants were the director of Arkitekturmuseet, Lena Rahoult together with Fredrik Kjellgren (architect), Petrus Palmér (designer), Birgitta Ramdell (director of Form/Design centre, Malmö) and the architectural historian Martin Rörby (Skönhetsrådet). The chair was Kristina Hultman. (2) Press release dated 19 December 2008, cited in Main Zimm (ed.) The Swedish Museum of Architecture: A Fifty Year Perspective, Stockholm: Arkitekturmuseet, p. 4. (3) Cited in “Stora förändringar föreslås på Arkitekturmuseet”, Arkitektur, undated, http://www.arkitektur.se/stora-forandringar-foreslas-pa-arkitekturmuseet (accessed 12/11/2012). 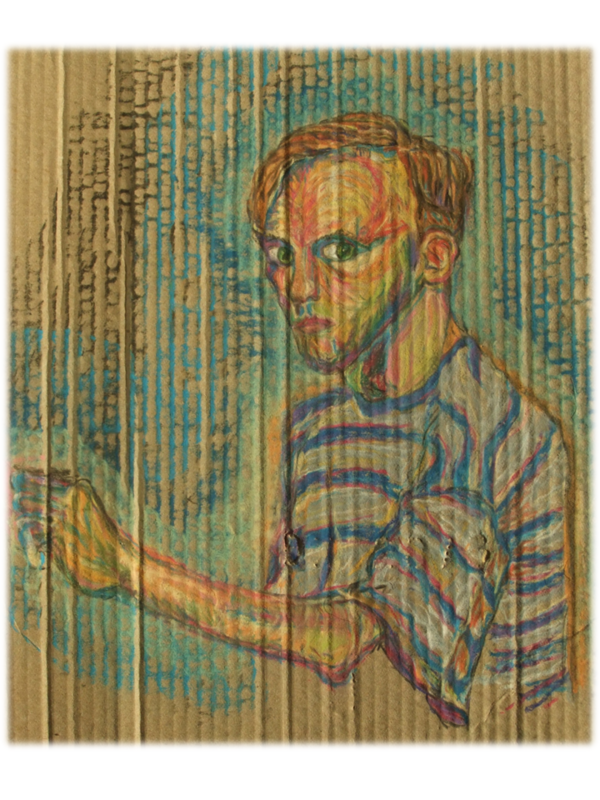 (4) Slow Art, Nationalmuseum, 10 May 2012 – 3 February 2013. The special event that took place on Sunday 11 November included a talk by Cilla Robach (“Slow Art – om hantverk, tid och kreativitet”) followed by a craft activity for children (see the advertisement on p. 7 of the Kultur section of that day’s issue of the newspaper, Dagens Nyheter). (5) Mikael Ahlund (ed.) Konst kräver rum. Nationalmuseums historia och framtid, Nationalmusei skriftserie 17, 2002, pp. 76-77. (6) Ahlund, 2002, p. 77. (7) Moderna Museet’s exhibition has been given the name “Moment – Le Corbusier’s Secret Laboratory” and will run from 19 January – 28 April 2013. The decision not to collaborate with Arkitekturmuseet is ironic given that the latter put together the exhibition “Le Corbusier and Stockholm” in 1987. (8) “Magnus Jensner slutar i Malmö”, Expressen, 20/10/2012, http://www.expressen.se/kvp/magnus-jensner-slutar-i-malmo. (9) “Arkitekturmuseets femtioårskris – en intervju”, Arkitektur, undated, http://www.arkitektur.se/arkitekturmuseets-femtioarskris-en-intervju (accessed 12/11/2012). (10) Hanna Weiderud, “Arkitekturmuseet bryter sig loss från Moderna”, SVT, 01/11/2012, http://www.svt.se/nyheter/regionalt/abc/arkitekturmuseet-bryter-sig-loss-fran-moderna. (11) Collections Management Policy, The Museum of Modern Art, available at, http://www.moma.org/docs/explore/CollectionsMgmtPolicyMoMA_Oct10.pdf. 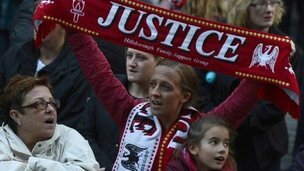 Hillsborough: The Report of the Hillsborough Independent Panel has just been published. This 400-page document investigates an incident which occurred on 15th April 1989 at the Hillsborough Stadium in Sheffield. On that awful day a soccer match between Liverpool and Nottingham Forest had to be abandoned when the Leppings Lane stand became overcrowded. The ensuing crush led to the death of 96 Liverpool football fans. This terrible loss of life and the unbearable grief of their loved ones have been compounded over the past 23 years by a deliberate and systematic attempt to cover up what happened. That much is clear from the report released today. In other words, our supposed custodians of law and order – both then and since – have been more interested in their own image and reputation than in finding out what went so catastrophically wrong. than the passing down of memory from one generation to another. Bloch had no need to restrict his attention to “the life of the past”. Because “the passing down of memory from one generation to another” occurs in the here and now. The Hillsborough disaster is history. But its living legacies are life, truth and justice in the present. These qualities should be our memorial to ten-year-old Jon-Paul Gilhooley who, together with 95 fellow supporters, became the innocent victim of official incompetence, misconduct and suppression on that fateful day in April 1989. (1) Hillsborough: The Report of the Hillsborough Independent Panel, September 2012, HC 581, London: The Stationery Office, p. 339. (2) Marc Bloch, The Historian’s Craft, Manchester: Manchester University Press, 2004, pp. 57-59. So wrote Art Spiegelman in his cathartic book, In the Shadow of No Towers (2004). This monumental tome is an analogue to the Twin Towers that Spiegelman saw vanish from the place this self-styled “‘rooted’ cosmopolitan” calls home. I am reading Spiegelman’s book to help me write my own work of memorialisation under the provisional title, “Forked no lightning: remembering and forgetting in the shadow of Big Ben”. Half-way through In the Shadow of No Towers, Spiegelman recalls feeling asphyxiated by the flag-waving nationalism that characterised the “mind-numbing 2002 ‘anniversary’ event” (p.5). A year later the same date left him railing against the exact same “jingoistic strutting” (p. 10). So perhaps Spiegelman was right to argue that there really is nothing like a good (or bad) commemoration to help you forget something? Then it struck me: today is Tuesday 11th September! It’s gone 9 pm as I write, which means that almost an entire “9/11” has passed by without comment from family, friends, colleagues, strangers or those hourly BBC Radio 4 news bulletins that punctuate my day. “The unmentionable odour of death offends the September night”. So wrote W.H. Auden in his poem “September 1st, 1939”. In 2003, Spiegelman asserted that this odour “still offends as we commemorate two years of squandered chances to bring the community of nations together” (p.10). And with that thought I slide my battered copy of In the Shadow of No Towers back into the oblivion of my bookcase. A lot of dust is destined to gather before a frisson of nostalgia prompts me to reach for it once again on 9/11/2021. I do hope that news of this depressing incident doesn’t reach Art Spiegelman. It’ll simply confirm his despairing belief that “brigands suffering from war fever have since hijacked those tragic events…” (p. 4). The first of these two trios was in considerable jeopardy when James Murdoch’s chum, Jeremy Hunt was the UK’s Secretary of State for Culture, Olympics, Media and Sport. It comes as absolutely no surprise to learn that Hunt has been relieved of this role in today’s cabinet reshuffle. Hunt’s unique leadership skills and flair for text messaging should have propelled him into the obscurity of the back benches. Instead, Prime Minister David Cameron has promoted him to Secretary of State for Health where he replaces another colossus of the political stage, Andrew Lansley. The idea of the NHS being run by Jeremy Richard Streynsham Hunt is all the inspiration I need to give up biscuits and take up jogging. There is, however, one minor benefit of Hunt’s promotion. During his appearance at the Leveson Inquiry he sat half-hidden behind the big desk like some penitent public school boy. It looked as if his arms had been amputated. 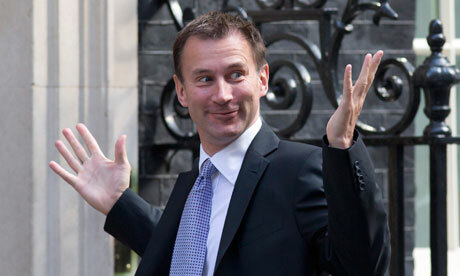 Keep that image in mind when savouring the flamboyant body language he will display as our guardian of the NHS. Meanwhile, Hunt’s successor as culture secretary is Maria Miller. She is one of the very few women to hold a front line post in Cameron’s cabinet. This means that she has been asked to double-up as "minister in charge of women and equalities". What on earth would Shulamith Firestone make of all this? Prior to taking up her new briefs, Maria Miller was the Minister for Disabled People. During her tenure she instigated the financially-motivated closure of most Remploy sites (factories which provided work from many hundreds of people with disabilities). boost the visibility of disability in museum collections and exhibitions. on which we map them for our own convenience. Zipsane must have been cursing those words as he announced the cancellation of Jamtli’s exhibition “Udda och jämt” (Odd and even). This was to have been a group show of contemporary Swedish art. Included in the line-up was Lars Vilks. He made a name for himself in 2007 with the publication of his drawings of the prophet Muhammad as a dog-shaped piece of street furniture. This triggered a furious and at times very violent reaction in both Sweden and abroad. Vilks is now obliged to live under police protection and has become synonymous with the polarised views pertaining to religion and freedom of expression. Whatever one’s opinion of Vilks, it is impossible to accuse him of hiding his views on such matters. This is confirmed by his much-publicised decision to travel to New York this month in order to take part in a conference entitled SION (Stop Islamization of Nations). Nevertheless, it seems to have been this specific action that led Jamtli’s leadership to change their mind about including Vilks in “Udda och jämt”. Yet they clearly failed to think through the potential consequences of this move. One by one the other artists in the show announced their decision to withdraw. Eventually it became clear that not enough participants remained and so the exhibition, which was due to open on 30th September, has now been cancelled. This incident touches on lots of highly sensitive issues and gives rise to a host of often strongly held opinions. Oddly enough it is this that appears to be the greatest problem. Earlier this morning a spokesperson for Jamtli appeared on Sweden’s national radio. She lamented that the debate that had arisen threatened to overshadow the art. If this is such a bad thing, why extend an initiation to a so-called conceptual artist like Lars Vilks in the first place? Could it be that Jamtli hoped that Vilks’ presence might have added a touch of spice to the mix – a little of that “good publicity” so craved by Zipsane? If so, this has all gone horribly wrong. “Udda och jämt” promises to be one of the most talked about shows in Jamtli’s history – whether it takes place or not. So why don’t its asinine leaders go ahead with the exhibition as arranged? The plans are no doubt well advanced; the text panels and labels for each artwork must be ready to be go. These could be mounted on the wall alongside works by those artists who still wish to participate. Meanwhile, large tracts of white space would indicate those works that have been censored by the institution or self-censored by the artists. Each (non)participant plus other interested commentators could be invited along to the opening. They could enter into debate over what has occurred, why and with what consequences. Each of the artists selected to take part in “Udda och jämt” would be compelled to explain their decisions. Did they withdraw in protest against the museum’s censorship, in support of Lars Vilks or for some other reason? One such protagonist is the painter, Karin Mamma Andersson. She is on record as criticising Jamtli’s belated and apparently arbitrary decision to ban Vilks. But, prior to that, she was presumably happy for one of her paintings to share a wall with a work by Vilks? Or was she unaware of his participation? Whichever was the case, what “Udda och jämt” reveals is the multivocality of artworks and the powerplays inherent in the artworld. Art and artists are constantly being reframed – by the media and by curators in museums. Art never “speaks for itself”. This has been confirmed by the Jamtli debacle. Yet, rather than capitalise on this rare opportunity to unpick the workings of the artworld, what does the museum do? Simply shuts its doors, withdraws from the fray and waits for normal service to resume. The greatest losers here are Jamtli’s public. Because if Jamtli’s leadership had the courage of their convictions and gone ahead with this non-show then something fascinating would have occurred: the audience itself would have taken centre stage. Regular museum-goers and first-time visitors alike could have voiced their opinions about this so-called public institution. Do they applaud or abhor the actions of the museum and the behaviour of the artists? The resulting dialogue would provide a roadmap for future decisions and contribute to an opening-up – a democratisation – of the museum. As it is, by cancelling “Udda och jämt” the likes of Henrik Zipsane have simply placed an embargo on proper debate. And it is this lack of informed discussion and argument that characterises the hysteria around religion and freedom of expression. The only winners here are those people who delight in spreading discord and miscommunication plus those misguided individuals and organisations who insist on separating “art” from life. (1) “Jamtli ställer in utställning”, Svenska Dagbladet, 29/08/2012, http://www.svd.se/kultur/jamtli-staller-in-utstallning_7458194.svd. This blog posting is being written in Kuressaare on the beautiful Estonian island of Saaremaa. I am here as a participant in the final meeting of Nordic Spaces. This was a four-year research project that has explored the notion of “Norden”, the literal meaning of which is “the North”. One of the keynote speakers is Jong Kun Choi of the Institute of East-West Studies, Yonsei University. Yesterday he gave an address entitled, “Modelling the Nordic Peace: Perspectives from Northeast Asia”. In it he presented an informative, entertaining and unusual viewpoint on one of those seemingly perennial facets of “the North”: peace. As he talked I started to surf the internet. My searches were informed by a text I have written as part of Nordic Spaces. (1) It focuses on the burgeoning and highly profitable Swedish arms trade. And, sure enough, I quickly discovered the sorts of things that go on under the radar of “Nordic peace”. Last year, for example, the Swedish arms company, Saab AB and the Republic of Korea secured a deal worth 450 billion Swedish kronor. (2) This concerned the purchase of an advanced weapon-locating system. The firm’s website indicates that this product has been “developed by Saab in Gothenburg, Sweden”. It is, therefore, as authentically Nordic as Saab’s Carl Gustaf, an 84 mm multipurpose, man-portable, reusable recoilless rifle which shares its name with the King of Sweden. Saab AB seems to like sweet-sounding weapons of mass destruction. The weapon-locating system making its way to the border between North and South Korea is called ARTHUR, which stands for ARTillery HUnting Radar. Isn’t it wonderful that a region so synonymous with peace feels morally able to contribute to political disputes and simmering conflicts elsewhere in the world? Oh, how the management of Saab AB must love the mantra “Nordic peace”! But be in no doubt: below the radar of our banal expectations is an utterly different conception of “the North” – one that certainly merits “remodelling”, to quote Jong Kun Choi. (1) Stuart Burch, “Banal Nordism: Recomposing an Old Song of Peace”, forthcoming in Performing Nordic Heritage: Museums, Festivals and Everyday Life (Aronsson, P. & Gradén, L., eds. ), Ashgate: Farnham, 2012. (2) “Saab Receives Order For Weapon-Locating System”, press release dated, 31/01/2011, accessed 24/08/2012 at, http://www.saabgroup.com/About-Saab/Newsroom/Press-releases--News/2011---1/Saab-receives-order-for-weapon-locating-system1. There has been a spate of scare stories recently about the "threat" to "our" heritage. These often centre on fabulously valuable artworks owned by extremely wealthy people. Occasionally the objects in question have been hanging quietly on the wall of a public art gallery - until, that is, the owner dies or runs out of cash. Unfortunately, the new owner will have to wait a while before getting their hands on it. This is because Britain's minister of culture has placed a temporary ban on its export in the hope that sufficient money can be raised to "save" this item "for the nation". This is exactly what occurred just the other day in relation to a painting by Manet. (2) It cost the Ashmolean Museum £7.83m to "save" this integral piece of British culture from the rapacious hands of a dastardly foreigner. But don't believe this rhetoric. Oh, and ignore the headline price and touching tales of little street urchins parting with their pennies to rescue this relic. It took upwards of £20m in tax breaks and donations from public bodies to ensure that national pride remained intact. Yet this doesn't bode well for Picasso's little bird-loving child, does it? The art fund (sic) must surely have run out by now. So too have the superlatives and dramatic warnings from our media luvvies and museum moguls. Indeed, their fighting funds were already seriously depleted after they chose to place £95m in the hands of the Duke of Sutherland - one of the richest men in the country. (3) This act of Robin Hood in reverse stopped the robber baron from flogging two paintings by Titian along with other trinkets he and his family had so generously loaned to the National Galleries of Scotland. And now the same museum is coming under "threat" again! Soon we will have to watch as Picasso's little bird migrates to sunnier climes. The national heritage will be fatally winged by this terrible loss. This is just as well because, in truth, the only repercussions will be a slight dent to national pride plus a small gap on a museum wall. This can be filled by any number of artworks that are currently in store at the National Galleries of Scotland. Until, that is, we are panicked by the next siren call as yet another integral piece of Britain's (ha!) much-loved heritage comes under covetous foreign eyes. Tell the world. Tell this to everyone, wherever they are. Watch the skies everywhere. Keep looking. Keep watching the skies. 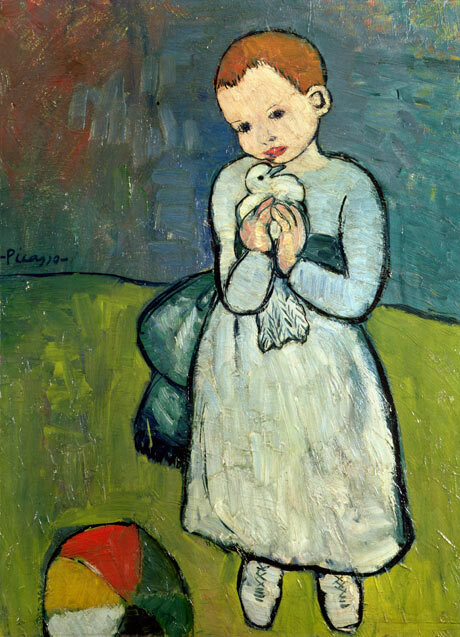 (1) Anon, "Picasso's Child With A Dove in temporary export bar", BBC News, 17/08/12, http://www.bbc.co.uk./news/entertainment-arts-19283696; Maev Kennedy, "Picasso painting Child with a Dove barred from export", The Guardian, 17/08/12, http://www.guardian.co.uk/artanddesign/2012/aug/17/picasso-child-with-a-dove-painting. (2) Stuart Burch, "Manet money", 08/08/2012, http://www.stuartburch.com/1/post/2012/08/manet-money.html. (3) Stuart Burch, "Purloined for the nation", 03/04/12, http://www.stuartburch.com/1/post/2012/04/purloined-for-the-nation.html. Portrait of Mademoiselle Claus by the French artist Édouard Manet (1832-83) has just been purchased for £7.83. This is far less than the sum that would have been achieved on the open market. The reason for this is because the British government refused to allow the painting to be sold to a foreign buyer. Once-upon-a-time export bars were justified on the grounds of ensuring that a work of art was being "saved for the nation". Interestingly, the new owner of the portrait - the Ashmolean Museum in Oxford - has rephrased this dubious claim. Manet's work, we are assured, has been "saved for the public". The museum is obviously keen to justify the expenditure on this portrait of a foreign person by a foreign artist. The purchase will, we are told, "completely transform" the Ashmolean, helping to turn it into "a world-leading centre for the study of Impressionist and post Impressionist art." Portrait of Mademoiselle Claus is, in other words, a commodity used as a means of competing with rival collections, both in the UK and abroad. However, the Ashmolean is only able to take part in the competition because this particular item of trade has not been allowed to reach its true "value". This is due to the fact that "aesthetic importance" and national pride are deemed, in this instance, to outweigh considerations of mere money. The result being that the Ashmolean was able to purchase the item in question for only 27% of its market value. The artwork's worth on the open market "net of VAT" was £28,350,000. The enormous difference between this and the £7.83m paid by the Ashmolean represents a huge loss in taxation - at a time when Britain's economy is in a parlous state and when the government (it claims) is doing its utmost to tackle tax avoidance. Mindful of this, the Ashmolean seeks to reassure us that it is "planning a full programme of educational activities, family workshops, and public events inspired by the painting." But consider for a moment how many "educational activities" could be implemented for, say, £20 million (the difference between the "true" value of the artwork and the sum paid by the Ashmolean). Fortunately we don't need to worry about this because money is very rarely talked about in our hallowed museums. Manet's Portrait of Mademoiselle Claus is destined to merge seamlessly into the Ashmolean collection and be toured around various temporary exhibitions. A little label will list the charitable organisations and anonymous givers responsible for "saving it for the public". Yet the true cost of the commodity will be omitted. Manet's money should not, however, be ignored. Nor should one further, pressing issue. Just because Manet's painting is now "publicly" owned does not necessarily mean it will never again become a financial commodity. Alterations to the Museums Association's code of ethics mean that public museums in the UK are now able to "ethically" sell objects from their collections, albeit in exceptional circumstances. This means that the same inventive logic and sleight of hand deployed to acquire Portrait of Mademoiselle Claus could be equally used to justify its future sale. As long, of course, that the money raised can be shown to be "for the benefit of the museum’s collection." Money might well be a taboo subject in museums. But the issues raised by Édouard Manet's Portrait of Mademoiselle Claus should serve to remind us that museums have their own carefully constructed economy: one that is just as inventive and artful as the "real" economy with its clever strategies of quantitative easing dreamt up by bands of unethical bankers. With this in mind, should the Ashmolean have been allowed to buy the painting under such circumstances? The answer, I think, is no. Instead, the British government should take a leaf out of the Museums Association's code of ethics. It ought to have allowed the export, on the condition that all monies raised in taxation from the sale were ring-fenced and used to fund "educational activities" in our museums. This would go some way to offsetting recent reductions in museum funding - with outreach and education programmes suffering disproportionately as a consequence. This outcome would be far more ethical and more effective than the spurious tokenism used by the Ashmolean to disguise its glee at acquiring a work of art that only a fraction of the public will see or have any interest in. "Donations help keep Manet in UK". So reads the title of an article about this matter in today's Financial Times. (1) The newspaper chooses to foreground the generosity of "1,048 people who donated sums which ranged from £1.50 to £10,000". Framing the story in this manner is a carefully considered ploy. It seeks to underline the sense of universal public support and popular approval for this deal. These contributions are certainly laudable. But they pale into insignificance given that the bulk of the £7.83m came from "the Heritage Lottery Fund, which contributed £5.9m, and the Art Fund, which gave £850,000". The support of these official bodies plus the above-mentioned loss in tax revenue mean that the Ashmolean's latest acquisition must indeed have cost the state at least £20m. This is, indeed, a conservative estimate. It is reported that 80% of the painting's value would have been levied in tax had it been sold on the open market. (2) It is the case, therefore, that the seller not only avoided a large tax bill; he or she also accrued more money by selling it to a UK museum for less than £8m as opposed to securing over £28m from a foreign buyer. So, in a way, the FT is right: a very large donation has indeed kept Manet in the UK. (1) Hannah Kuchler, "Donations help keep Manet in UK", Financial Times, 09/08/2012, http://www.ft.com/cms/s/2/4168b256-e174-11e1-92f5-00144feab49a.html. (2) Maev Kennedy, "Ashmolean buys Manet's Mademoiselle Claus after raising £7.8m", The Guardian, 08/08/2012, http://www.guardian.co.uk/culture/2012/aug/08/ashmolean-buys-manet-mademoiselle-claus.